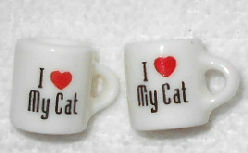 Here are two little coffee cups (they appear to be ceramic but we are not sure). They are 1/2" high x 3/8" across the top, not including the handle. There are two little charms in the package. Previously owned but in good condition.